Some Compact Framework SDKs (SQLCE, Symbol, OpenNETCF), when they install on a development machine, install a deployment “package”, which is a Visual Studio construct that associates one or more assemblies with a CAB file. When you add a reference to one of those assemblies and deploy to a device, the entire CAB file installs instead of the individual assembly. In Visual Studio 2005, the definition of these deployment packages consists of an XSL file deeply nested in the Application Data folder (the file name is conman_ds_package.xsl). Though I couldn’t find any reference to this at all on the Internet when I first played around with this, you can edit this file, and even remove package definitions altogether, which will circumvent this mechanism and deploy only the assemblies you explicitly reference, as you would expect it to behave in the first place. I’m not recommending this as a general practice, but it sometimes comes in handy: it’s nice to have that level of control over which assemblies are selected and how they get deployed. My article on the frustrations and oddness with references illustrates some of the problems of “hiding the details” to such an extent that the ultimate behavior is unpredictable and difficult to troubleshoot. I have so far been unable to find these deployment package definitions in Visual Studio 2008, nor have I found any part of the IDE that allows you to view or edit this. This is a fundamental design flaw. If you’re going to raise the level of abstraction, providing a way to make the guts visible and editable is essential for traceability and debugging, especially when the mechanism itself is flawed or is misused by third-party vendors. For example, there is apparently some room for misinterpretation between where the CAB is located and where Visual Studio actually looks for it when deploying to a device. When deploying a Symbol DLL file, Visual Studio notices that a Symbol deployment package exists, presumes it’s installed under the current Visual Studio directory (in my case, with Visual Studio 2008, it’s the directory Visual Studio 9.0), and proceeds to deploy from that location. Unfortunately, the CAB file doesn’t actually exist there, so a deployment error results. Error 1 Deployment and/or registration failed with error: 0x8973190d. Error opening file ‘C:\Program Files\Microsoft Visual Studio 9.0\smartdevices\sdk\Symbol Technologies\wce500\armv4i\symbol.all.arm.cab’. Error 0x80070003: The system cannot find the path specified. Symbol’s .NET SDK v1.4 presumes you are using Visual Studio 2005, and installs itself into the Visual Studio 8.0 directory under Program Files. This presumption is such an obviously bad practice, it simply shocks me. They have their own install directory in “C:\Program Files\Symbol Mobility Developer Kit for .NET” where (a little deeper) they keep a copy of the CAB file, which exists independent of any tool that might use it (different versions of Visual Studio, SharpDevelop, etc.). SQL Server CE / Compact has the same problem, depending on whether it gets installed with Visual Studio or is installed as a separate SDK. I mentioned SQLCE SDK directory confusions in this article. So take note: if you’re distributing an SDK, use a little common sense (and consistency) when deciding where to install it, and what presumptions you’re making about your audience. Learn from SQLCE, Symbol, and others, what not to do. Port-based messaging has been in practice for a long time. In the realm of low-level electronics, components have always been operating in parallel, hardware interface ports are designed around standards, and messages are posted to those ports, queuing up somewhere until the receiver is ready to process them. This pattern has worked extremely well in multiple domains for a long time, and its key characteristic is the decoupling of data flow from control flow. In sequential programs, one statement runs after another each time it’s run, and the behavior is predictable and repeatable. Concurrency is difficult because you have to consider all possible interleavings of multiple simultaneous tasks, so the overall behavior is nondeterministic. Depending on the relative timings of concurrent tasks, you could get different results each time if you’re not careful to set the appropriate locks on shared resources. Port-based messaging architectures isolate islands of state across different execution contexts, and connect them with safe, atomic messages delivered through pre-defined ports. The posting of a message to a port, as shown in Figure 1, is followed by some handler method that is receiving and processing messages. What’s not evident in the diagram, however, is that while data flows into the port, that posting is a non-blocking call. The sender continues on doing other work, taking the time only to queue up a message somewhere. Queuing is important because, even with large thread pools, we can’t guaranty that a receiver will be listening at the very moment a message arrives. Letting them queue up means the receiver doesn’t have to block on a thread to wait. Instead, the data waits and the thread checks messages on the port when it can. So what exactly is a port? A port is a communication end point, but not in the sense of “a web service on a physical server”. Think much more fine grained than that, even more fine-grained than methods. With sequential programming, we commonly use try-catch blocks and handle both the exceptional and non-exceptional results of operations within a single method. In port-based programming, you post a message to a port, which results in some handler method running on the receiving end, and different results can be sent back on different callback ports depending on the type of message. Instead of calling a method that returns back to you when it ends, port-based programming is about always moving forward, and unwinding a call stack has very little meaning here. We can see in the sequence diagram above (Figure 3) a collection of services that communicate with and depend on each other. Starting from the top, the left-most service posts a message to port 1, and then goes on to do other work or surrenders its thread back to the dispatcher for other tasks that are waiting to run. A registered method on port 1 runs, and the logic there needs another service to complete it’s task, so it posts a message on port 2, and also continues processing without waiting. The path of solid blue arrow lines traces the message path for normal execution. If anything goes wrong, an exception can be posted to a different callback port, shown with a red outline in the diagram. This diagram shows one possible composition of services and data flow. 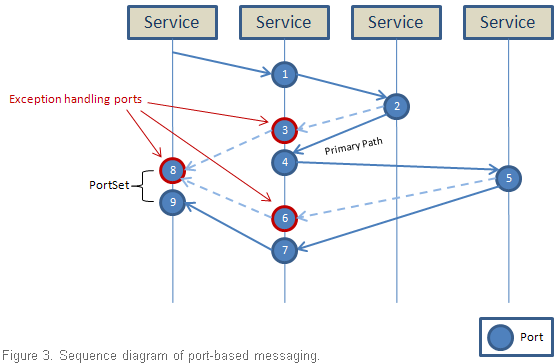 Port sets, which are simply a collection of related ports, are shown as callback receivers in pairs, but they can consist of any number of ports with any mixture of messages types, depending on the needs of the system being coordinated. In this example, if anything goes wrong in the handler methods at ports 2, 5, or 6, an exception message will be routed to port 6, where another handler method can compensate for or report on the error. Also note that while during startup this system may have to process data at port 4 before the logic at ports 5, 7, and 8 can run… once it gets going, there could be activity operating at many ports concurrently (not just one port per service). 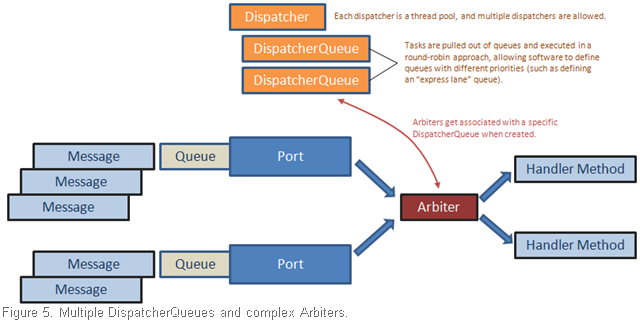 An arbiter is a rule (or set of rules) about when and how to process messages for a specific port (or set of ports). (It is helpful to think of arbiter as a data flow or message flow coordinator.) Should messages be pulled off the queue as soon as they arrive? Should the software wait until 5 messages have arrived before processing them all as a group? Should messages be checked according to a timer firing every 20 seconds? Should logic be run only when two ports have messages waiting (a join)? What logic should be run when one of these conditions occurs? Can method handlers on three specific ports run concurrently until a message arrives on a fourth port, whose handler must run exclusively, and when done the other three can run again (interleave)? These are just a few of the many coordination patterns that can be expressed with different types of arbiters (and hierarchically nested arbiters, which are ingenious). The next diagram (figure 5) could represent a join coordination. An arbiter waits for messages on two ports, and depending on how it’s defined, it may process messages from one port repeatedly, but as soon as it receives a message on the second port (it may be an exception port, for example), the whole arbiter might tear itself down so that no more handling on those port will occur. As you are probably starting to see, composition and attachment of arbiters are key to controlling specific patterns of coordination in arbitrarily powerful and flexible ways. In the Concurrency & Coordination Runtime, we can attach and detach these arbiters during runtime; we don’t have to define them statically at compile time. There has been some criticism towards this approach because dynamic arbitration rules are much more difficult to verify formally with analysis, and are therefore difficult to optimize compilation and thread management for, but the advantages of this flexibility are enormous and the performance (see this paper by Chrystanthakopoulos and Singh) has been very impressive compared to conventional multithreading approaches. Ultimately, it’s not about whether we can guaranty 100% that nothing will go wrong using only the mathematical models currently in our repertoire, but whether we can be productive with these techniques to release software that meets acceptable quality standards across a broad range of application domains. I don’t think we’re going to find a better set of strategies to work with anytime soon, and when we’ve pushed this technology hard enough, the tactics will be fine tuned and we can start absorbing some of these coordination concepts into languages themselves (without sacrificing the dynamism that a library of composable parts provides). People are going to attempt concurrent programming whether it’s safe or not, and using a library such as the CCR significantly reduces the risk of ad hoc multi-threading code. When mainstream operating systems like Windows took their first steps to support multi-tasking, cooperative versus preemptive multi-tasking was a common topic. The idea of an operating system depending on applications to surrender control in a well-behaved way was generally and rightfully considered a bad idea. Any kind of error or instability in software could easily bring down the entire operating system, and enforcing a quickly growing community of software vendors to share nicely wasn’t a realistic option. Being preemptive meant that the OS could forcefully stop an application from running after giving it a small, measured slice of time, and then switch the thread to a new context where another application could run for another time slice. Regardless of how poorly applications ran, as benevolent dictator, the OS could ensure a fair scheduling of processor time. The solution encapsulated in the Concurrency & Coordination Runtime is, on the other hand, a cooperative multi-tasking strategy. However, because it operates within the local scope of an individual process, and is isolated from other processes in the same OS, its risk of destabilizing the system is nonexistent. This deep level of cooperation, in fact, is what gives the CCR its great performance. When used correctly, which George Chrysanthakopoulos (in this video) and his colleagues have brilliantly put within our reach in the CCR library, threads don’t sit around waiting on some resource or for long-running operations to complete; instead, control is freely surrendered back to the thread pool, where it is quickly assigned to a new task. just do your job, then let go. In sequential programs, stacks are used to unwind method calls and provide return values (return messages), and threads follow the data flow; whereas in port-based programming, threads are managed by one or more thread dispatchers that are capable of maximizing the use of that thread by making it available in a pool and sharing it with with many other (potentially unrelated) tasks. Data flows orthogonally and according to a different coordination strategy than control flow. This task-thread agnosticism (the opposite of thread-affinity) is similar to the statelessness of a web server such as IIS; one or more threads from a large pool are injected into the tasks of processing, rendering, and serving up huge numbers of web pages, after which those threads are recycled back into the thread pool for execution of other tasks for a highly concurrent and scalable service platform. So herein lies the trick: in order to split this coupling between data flow and control flow, a different means is needed to compose the two coordination strategies. In C# and other popular imperative programming languages, methods implicitly pass thread control along with data arguments (the message), and the use of the stack for method calls asserts constraints on control flow, so making the CCR work involves some interesting patterns. That’s why port-based programming is hard to get your head around. It’s such a large shift from common sequential logic and it requires some additional planning (and good visualizations). It’s obviously important to have a good set of tools for expressing that coordination, a simple set of conceptual primitives that allows us to compose arbitrarily-complex coordination patterns. These primitives, including Message, Port, PortSet, Dispatcher (thread pool), and others provide the building blocks that we can use to define these relationships. Once we define what we want to happen with these building blocks, the CCR can make it all happen. This level of coordination is a level beyond the strategies used by most concurrent applications and frameworks in software today, primarily because there hasn’t been a pressing need for it until recently–processors had been growing phenomenally in speed for many years. Now, however, we’re told that processor speed has plateaued, that we now have to scale out to scale up, spreading the processing load across multiple cores. We are very fortunate that the work being done by researchers in fields like robotics can be applied in other service oriented architectures, and is a testament to the widespread use of the .NET Framework and the fantastic efforts of some very bright individuals. Robotics Studio is a free download and can be found here, and while it is full of other good stuff, it’s worth checking out for the Concurrency and Coordination Runtime alone. So there I was, minding my own business, creating some custom controls in a reusable framework project. I needed to apply some design-time attributes, and because I’m working with Compact Framework, I attempted to add my DesignTimeAttributes.xtma file to accomplish this, which I’ve done many times before. Bang! I got an error message: “genasm.exe has encountered a problem and needs to close. We are sorry for the inconvenience.” In the task list was this error: “Process is terminated due to StackOverflowException.” Stack overflow?! I checked (and checked again) to make sure that my .xtma file was properly formatted, which it was, and I simplified it to include only a single DesktopCompatible attribute; being a boolean, I figured it was hard to mess that up (compared to something trickier like a Designer attribute). But alas, I was stumped, and for the past week or two gave up and went without the attributes in that project, putting the majority of my controls in a separate project. Today I decided I was on the mission of isolating the problem and getting to the bottom of this. While I don’t know the root cause (I’ve submitted a bug report to Microsoft), I can reproduce the problem and describe the pitfall so some poor soul can find it while Googling for help. Note that if these classes are changed from public to internal, the problem disappears. That’s it, and I get the nasty errors described above. I’m really curious to know what genasm.exe is doing, how it’s using some recursive algorithm to examine somewhat self-referencing generic definitions (I admit that the generics constraint in the code above is a bit on the odd side). The .NET Micro Framework is a compatible subset of the full .NET Framework, similar to how the Compact Framework is a subset. But the Micro Framework can act as its own real time operating system (RTOS) instead of loading the tiny CLR in a host operating system, and works with a variety of hardware devices, including those that don’t have their own memory management unit (MMU). The gist is that embedded applications as well as low-level drivers can now be written in managed code (a huge leap forward), and take advantage of garbage collection, strong-typing, and other nice features that are typically absent in embedded systems programming. This supposedly reduces errors, boosts productivity, and reduces development costs. I’ve been watching videos like this, reading about the Micro Framework for the past few months, have pre-ordered this book from Amazon, and have been itching to get my hands on a hardware development kit to start experimenting. The only problem is that the interfaces for these embedded devices are so foreign to me (I2C, GPIO, etc. ), and I’m not exactly sure what my options are for assembling components. What kinds of sensors are available? Do I have to solder these pieces together or is there a nice modular plug system similar to the SATA, IDE, and PCI connectors on modern computers (but on a smaller scale)? Do I have to write my own device drivers for anything I plug in, or is there some abstraction layer for certain classes of inputs and outputs? The other issue that makes me hesitate is the thought of programming without language conveniences like generics on a more resource-constrained device than the Windows Mobile devices I’m already frustrated with (and have been for the past four years). I’m not saying that I’m not excited about managed code on tiny embedded devices, and I’m not saying I won’t start playing with (and blogging about) this important technology sometime in the next few months, but I’ve discovered another platform for embedded device development with the ability to interact directly with the physical world that offers a much lower technical barrier for entry, so that’s where I’m starting. Without having studied them both in depth yet, the CCR seems to cannibalize on the Task Parallel Library (TPL), at least conceptually, offering a much more complete system of thread manipulation and synchronization than the original System.Threading types, all for a vertical industry that has much greater demands of a concurrency framework that must, for example, deliver massive concurrency and complex coordination rules in a highly-distributed system, all the while handling full and partial failures gracefully. Some of the patterns and idioms for making concurrency and synchronization operations easy to write and understand are masterfully designed by Henrik Nielsen and George Chrysanthakopoulos (and I thought Vanderboom was a long name!). The fact that the CCR and DSSP were developed together is significant. Tasks running in parallel need to be manipulated, coordinated, and tracked regardless of whether they’re running on four processors in one computer or on 256 processors spread across a hundred devices, and distributed services need a dependable way of parallelizing their efforts on individual machines. This is a synergistic relationship, each subsystem enhancing the elegance and usefulness of the other. So why not use the CCR in every application instead of developing the TPL? Are these two teams actively collaborating, or have they been building the two frameworks in isolation? I also have to make special mention of the decentralized software services, which as a protocol sits on top of HTTP in a RESTful implementation. It supports composition of services by creating partnerships with other services, defining securely which partnerships are allowed, offering identification and discovery of services, and much more. In this assembly then, we have a robust library for building distributed, composable, decentralized services-oriented systems with event publication and subscription, with services that can be hosted on desktop and mobile computers alike. Wow, call me a geek, but that’s really frickin’ cool! Some of the ideas I have for future projects require this kind of architectural platform, and I’ve been casually designing bits and pieces of such a system (and got so far as getting the communication subsystem working in CF). Now, however, I might be turning my attention to seeing if I can’t use the Robotics Studio APIs instead. One thing to be clear about is that Robotics Studio doesn’t support Micro Framework, at least not yet. I wonder exactly how much value there would be to adding this support. With hardware options such as this 2.6″ x 2.3″ motherboard with a 1.6 GHz Intel Atom processor, video support, and up to 1 GB of RAM, capable of running Windows XP or XP Embedded, and priced at $95 (or a 1.1 GHz version for $45), we’re already at a small enough form factor and scale for virtually any autonomous or semi-autonomous robotics (or general embedded) applications. There’s also the possibility for one or more Micro Framework devices to exchange messages with a hardware module that is supported in Robotics Studio, such as the tiny board just mentioned. Where do we go next? For me, I just couldn’t resist jumping in with both feet, so I ordered about $500 in robotics gear from Phidgets: USB interface boards, light and tempature sensors, a 3-axis accelerometer (think Wii controller), motors and servos, an RFID reader with tags, LEDs, buttons, knobs, sliders, switches, and more. I plan to use some of this for projects at CarSpot, and the rest simply to be creative with and have fun. I also pre-ordered this book, but the publication date is set for June 10th, so by the time I get it, I may have already figured most of it out. I’m loving extension methods. All of the methods that I wish BCL classes had, I can now add. While I consider it highly unfortunate that we can’t yet add extension properties, events, or static members of any kind, still it’s a great amount of power in terms of making functionality discoverable in ways not possible before. During the implementation of my Compact Framework application’s MVC framework, I wanted to support displaying views modally. However, using a screen stack of UserControls that are all hosted in a single master Form object, I lose out on this built-in functionality and so found myself in need of creating this behavior myself. 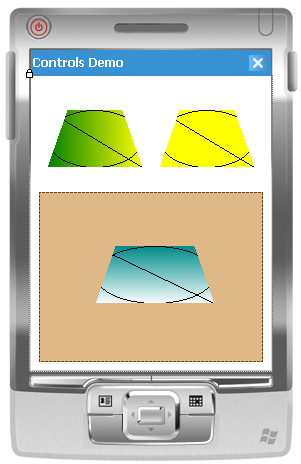 One of the difficulties in doing this is displaying a view that may not cover every portion of other views beneath it; if the user clicks on one of the views “underneath”, that control gets activated, and if pressed on a control, that control will handle the event (such as Button.Click). My solution to the problem is simple. 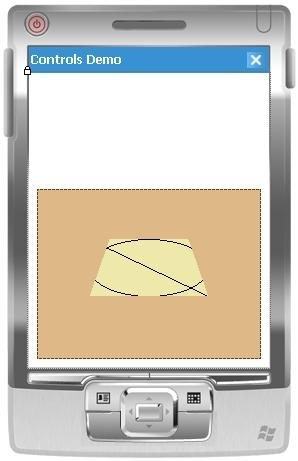 Take a snapshot of the master form and everything on it, create a PictureBox control that covers the whole form and bring it to front, and set its image to the snapshot bitmap. Doing this provides the illusion that the user is still looking at the same form full of controls, and yet if they touch any part of the screen, they’ll be touching a PictureBox that just ignores them. The application is then free to open a new view UserControl on top of that. When the window is finally closed, the MVC infrastructure code tears down the PictureBox, and the real interface once again becomes available for interaction. Here is the full source code for taking a snapshot of a form (or any control), as well as adjusting the brightness. …and voila! I have a snapshot. Note that because Darken extends Bitmap, it can now be used with any Bitmap. As we read from this code from left to right, we’re observing a pipeline of transformations. MyForm is the source data, GetSnapshot is the first step, Darken is the next change, and with more extension methods on Bitmap we could continue to process this in a way that is very natural to think about and construct. I do have to admit that I cheated a little, though. Even with the direct memory manipulation with pointers, it still didn’t perform very well on the Symbol and DAP devices I tested on. So instead of adjusting the brightness on every pixel, I only darken every third pixel. They’re close enough together that you can’t really tell the difference; however, the closer to 100 percent you darken or brighten an image, the more apparent the illusion will be, since two thirds of the pixels won’t be participating. So it’s good for subtle effects, but I wouldn’t count on it for all scenarios. This every-third-pixel dirty trick happens in the for loop, where you see i += 3, so go ahead and experiment with it. Just be careful not to set it to large even numbers or you’ll end up with stripes! I’ve been having a lot of fun learning how to create rich design-time experiences for custom controls in Compact Framework for the past few days. It’s been frustrating, and the documentation is hard to find unless you’re already familiar with the metaphors and know the buzzwords. While this first article won’t be completely comprehensive, I will continue to write about this topic until I have covered all of the bases necessary for you to create professional, polished controls and design-time experiences suitable for commercial use or sale. I’m going to assume you have at least some experience in creating custom controls, at least for desktop applications. Creating custom controls for Compact Framework applications is another story, however. Not because of any particular constraints of memory of screen real estate, but because the typical method for attaching metadata to specify design-time behavior is different. There are some other subtleties and oddness as well that are specific to the Compact Framework. In the full .NET Framework, we have many attributes at our disposal to specify design-time behavior; most of these can be found in System.ComponentModel. We have access to a lot of these for mobile device applications, but because they’re not included in the Compact Framework, we need another way to associate them with our control classes and their members. This is done through something called the “design-time attributes file”, which has an extension of .xtma. There are two ways to add this file. 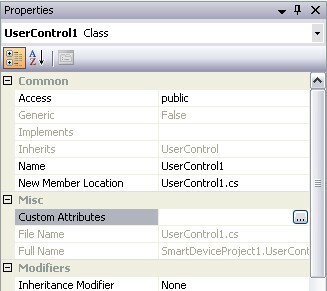 The method that people typically suggest is to add a class diagram to your project (right-click on your project in Solution Explorer, and select View Class Diagram), select an item in the diagram, edit the Custom Attributes property in the property grid (see screenshot below), click on the ellipsis (…) to open a pop-up window, and then enter an attribute such as DesktopCompatible(true). When you click the OK button, a new file will be added to your project called DesignTimeAttributes.xtma, and this file will open in Visual Studio. This is quite a round-about way to create the file in my opinion, and it presumes that you know a valid attribute to add right from the beginning. I personally don’t use the class diagrams, and I think it’s easier just to add the .xtma file directly, by right-clicking on your project in Solution Explorer, Add—New Item, and selecting Design-Time Attribute File. Editing your attributes directly in this XML file instead of the pop-up window in the class designer has the benefit of providing you with some Intellisense (which it gets from the associated XSD file). I get a little disappointed when I see people list only the most common attributes that I already know about, and then fail to mention the rest of the attributes that are supported in Compact Framework, and since the list isn’t unmanagable—and easily determined from Intellisense—I will list most of them that are supported .xtma file here, and in a future artile will provide the remaining ones. Here’s a screenshot showing the full list of tags that you can use at the class level. Most of them are attributes, while some of them like Event, Method, and Property allow you to specify specific members of the class so that you can apply attributes to just those members. ApplyDeviceDefaults – I couldn’t find any mention of this in the normal area of MSDN that enumerates all of the classes, but I did find it explained well in this MSDN article. ComplexBindingProperties – For complex data binding, of course. DefaultBindingProperty – This is for simple data binding. DefaultEvent – The default event for Button is Click. When you double-click on a control in the designer, Visual Studio switches to the code behind file and will automatically generate this event’s handler for you. Very handy. DefaultProperty – When you select a control in the designer, this is the property in the properties window that gets focus first. For the Label control, this is the Caption property. Description – The description text appears in the properties window below the grid of property names and values, and can provide useful information about the meaning of a property or event. Designer – The Designer attribute is one of the primary gateways for providing rich design-time experiences for your controls. Creating custom designers and associating your controls with them is a tricky business, and one I intend to explore in depth in this and future articles. Because MSDN documentation in this area is rather sparse, I’ve begun contributing to the community content on the MSDN pages, and you’ll see the help I’ve added at the very bottom of the page if you follow the link for this item. DesignerSerializer – Located in System.ComponentModel.Design.Serialization, a DesignerSerializer is used to provide a custom way of serializing your control to code in the designer partial class file. I haven’t had a need yet to use this, but if someone can think of a real-world scenario that requires it, I will be happy to explore the subject further and write about it. DesignTimeVisible – Indicates whether a control can be shown on a designer, and is supposedly ignored by “components with a UI presense”, whatever that means. A little more usefully, MSDN states that it is useful when you have a control that accepts child components, such as the TreeView whose node items “should not appear in the component tray because they are drawn by the TreeView control”. This will require some more exploration. DesktopCompatible – This is the first design-time attribute I became familiar with in working with Compact Framework controls. If you have a control that makes P/Invoke calls, Visual Studio is uncertain whether they’re device specific OS calls, and to be safe, it doesn’t execute your control’s code, which means your control can’t render itself even on the designer surface. You get a message telling you that it’s unsafe. To get around this, and presuming that it is indeed safe to run your control’s code on the desktop (I’ll explain more about this later, or you can read this article by XinYan), just add a DesktopCompatible attribute to the control class, and you’ll be back in business. I’m not sure where this attribute is located; it’s not a desktop attribute, so it’s not in the full .NET Framework’s System.dll, and a search through Reflector didn’t locate it, so I’ll have to keep looking. But it’s there, and it works. 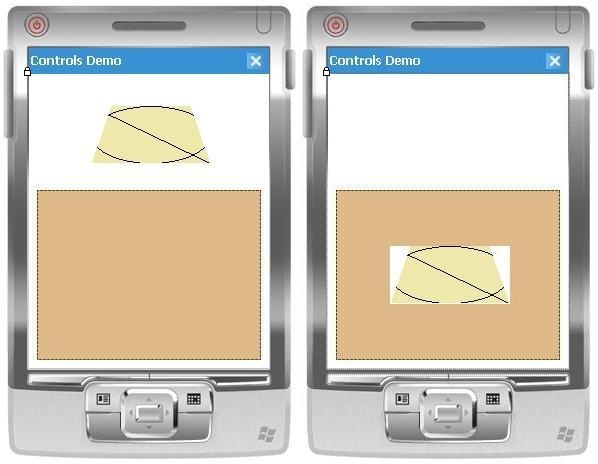 Docking – Specifies the default docking behavior for controls. This is located in System.Windows.Forms. Editor – If you need a more powerful experience for editing complex properties within the properties window itself, this attribute will allow you to hook into one. I’ll be covering over custom editors in detail. 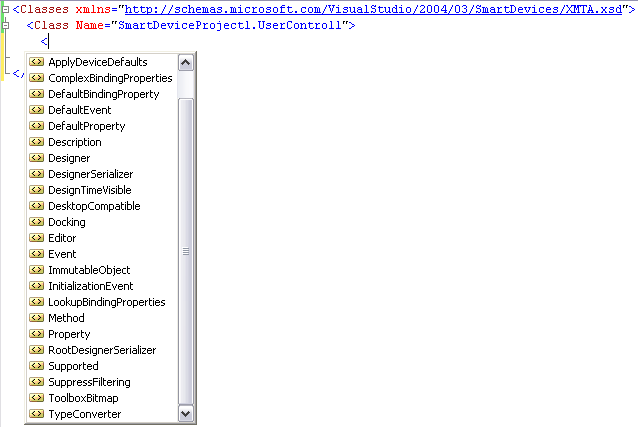 ImmutableObject – Specifies that an object has no subproperties capable of being edited, per MSDN documentation. Not sure what the benefits of that would be: perhaps to hide all properties for a class without having to hide each one separately? InitializationEvent – This is used to support auto data-binding (by Visual Studio wizards I’m guessing), so it knows which event to hook into when generating the data-binding code. RootDesignerSerializer – I’m not sure what this was for originally, but according to bug report, this attribute is both deprecated and broken. Supported – Explained in this blog as part of Platform Verification Task. Located in Microsoft.CompactFramework.Build.Tasks. You can use this attribute to indicate that a class or member is not supported for the specific platform. SuppressFiltering – Located in Microsoft.CompactFramework.Build.Tasks. ToolboxBitmap – This simply specifies the bitmap that will be displayed in the toolbox. Located in System.Drawing. TypeConverter – Specifies the TypeConverter class used for a property. TypeConverters are an important aspect of the design-time experience and merit further explanation. Browsable – This determines whether a property or event will be displayed in the properties window, and is typically used to hide properties or events that must be public for some reason but aren’t meant to be manipulated during design time. Category – If you set this to an existing category name, your property or event will appear in there; if you create your own category name, a new category will appear in the properties window. There are a few more that are specific to properties, events, and methods, but this will give us a good start. I’ll cover the remainder in future articles. That seems like a lot at first glance, but chances are that you’ll only need a handful at any given time. With a little exploration and practice (and guidance from myself and others whose blogs and other resources I’ll share), you could soon be a master of rich, no-compromise custom control development for Compact Framework applications. I believe this is a worthy cause, for one because there is a scarcity of good third-party controls, especially when compared to the abundance that we have for the desktop world of .NET development; but also because I have personally struggled with Compact Framework development and have always thought it would be nice to have a step-by-step series of tutorial to follow for creating custom controls. I’ve found many useful and helpful articles, but nothing that really brings it all together in a clear manner. The magic happens when you build your custom control project. Visual Studio builds not only your control project in its runtime form, but also generates another assembly with .asmmeta.dll after your own target assembly name.